Anglo-Dutch songwriter, Gitta De Ridder is excited to release new album For Everything A Season on March 23rd; including new single The Wheel which was released on February 16th. The songs on For Everything a Season are a journey of experiences through life and relationships; although themes across the album are quite universal, the lyrics also reflect a part of Gitta’s personal and relational explorations across the past years. Album opener My Dear, Oh Boy, Oh Man, released in late 2017 epitomises the tone for the record; a song about love and loss, about finding the strength to move on and let bygones be bygones. New single The Wheel encapsulates the natural, almost hypnotic, rhythm of travelling and speaks about how we see all things through our conditioned view. Taking control of the wheel means breaking down what we think we know, to find our own voices and realise what is truly important in life. The video shows the overwhelming nature of our modern need for ‘stuff’ and how we are being fuelled by advertisements and fashions rather than actually being present and focussing on true connection and importance. 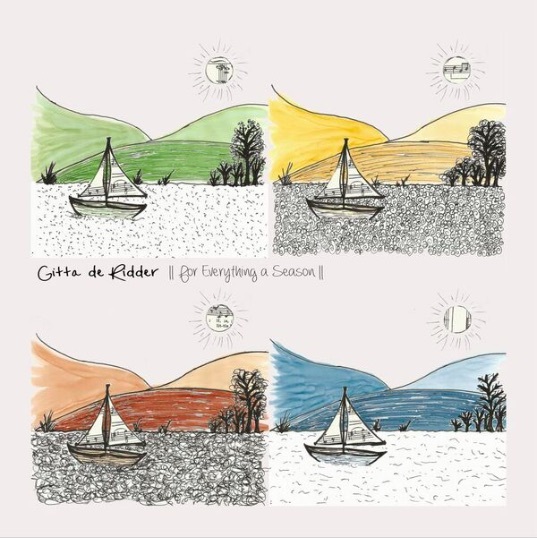 For Everything a Season is also released as a series of seasonal EP’s built of three songs on each, collected together in a boxset available via subscription; the songs linked to the season stand metaphor for the cycles we move through in life. The first three songs of Spring are about starting anew and letting go. The Summer tracks about the blossoming of love and standing strong in the realisation that there is contrast in everything. While Autumn tracks revolve around the inevitable changes that come and staying present through them leading you into Winter, representing finding calm and peace in hard times and heartbreak. The Boxset version of the album also features bonus track Baby Darling Blue. Recorded in the beautiful Suffolk countryside studio of long-standing friend Stephen Hodd, For Everything a Season is the next step following the success of previous release Feathers in 2016, showcasing Gitta’s distinctive talent to create songs both familiar and innovative. The poetic nature of each song goes straight to the heart, with charming vocals and intimate guitar-work lulling you into a joyful glow. Originally growing up in the Netherlands, Gitta taught herself to write and play songs on the guitar from a young age, and cites modern folk artists such as Iron & Wine, Ane Brun and Sufjan Stevens as her inspiration.